The German cockroach is one of the most common and resilient pests in urban environments. In addition to demonstrating behavioral aversion to certain bait ingredients, German cockroaches have shown resistance to 43 active ingredients1, ultimately making your jobs more difficult. 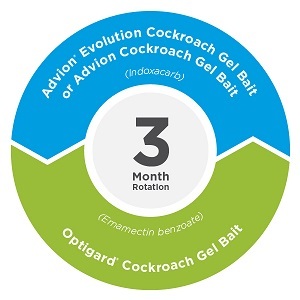 To address these challenges, Syngenta offers a portfolio of effective cockroach solutions that feature unique modes of action and highly attractive matrices that can be used together as part of a bait rotation strategy. Cockroaches know a lot about flavor, which is why it's important to rotate gel baits to help manage potential aversion and resistance. The active ingredients in Syngenta cockroach solutions allow them to be used as part of a recommended three-month rotation, which matches the average life cycle of a German cockroach. By strategically rotating these products, you can help provide your customers with environments free from the threat of cockroaches. For more information, please visit www.SyngentaPMP.com/CockroachSolutions. 1Whalon M. E., Mota-Sanchez M., Hollingworth R. M. 2016. Arthropod resistant to pesticides database (ARPD). Available online: http://www.pesticideresistance.org/display.php?page=species&arId=215 (accessed 16 July 2018). ©2018 Syngenta. Important: Always read and follow label instructions. Some products may not be registered for sale or use in all states or counties and/or may have state-specific use requirements. Please check with your local extension service to ensure registration and proper use. Advion®, For Life Uninterrupted™, MetaActive™, Optigard® and the Syngenta logo are trademarks of a Syngenta Group Company. All other trademarks are property of their respective owners. Syngenta Customer Center: 1-866-SYNGENT(A) (796-4368).